It is considered an inhibitory neurotransmitter, which means it regulates brain and nerve cell activity by inhibiting the number of neurons firing in the brain. 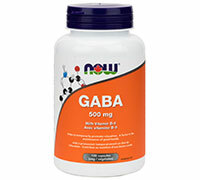 GABA is referred to as the "brain´s natural calming agent". NOW provides only the naturally occurring L-form as found in food and in the body. Directions: As a dietary supplement, take 1 capsule 2 to 3 times daily as needed, preferably with juice or water on an empty stomach.